Padangbai in East Bali offers a quiet place to relax. The 3 beaches (the main beach, Blue Lagoon to the north and Pantai Kacil to the south) are white sand and great for swimming / snorkeling. The great thing about Padangbai is the simple bamboo accommodation and the access to the 2 beaches. 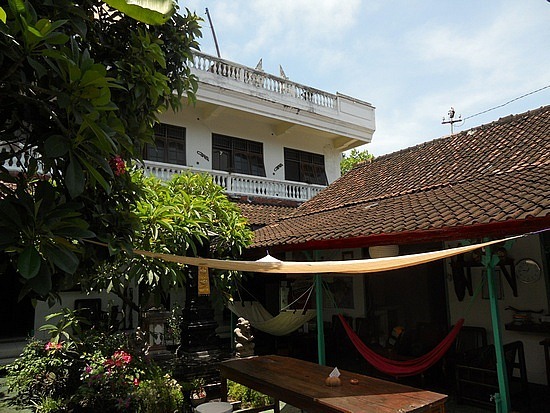 Here is a rundown of the accommodation options in Padangbai. Located a ways inland from the beach on Jl. Segara. Simple family owned budget place. Cold water. Centrally located 50 meters in from the beach, nice upstairs rooms. AC / hot water 125,000rp per night, fan / cold water 75,000rp per night. Located 35 meters in from the beach on Jl. Segara. Offers a selection of rooms from cold water / fan (40,000rp per night), hot water / fan (60,000rp per night) to hot water / AC (150,000rp per night). Located in the middle of the main beach. Has bungalows and thatched cottages. Cold water. 50,000rp per night. Located on the main beach. Budget place with 2-storey block of rooms with cold water. 50,000rp. Located on the main beach, older and newer rooms, cold water, nice garden. Budget prices. Located 300 meters back from the beach at the Nusa Penida jetty. Large amount of rooms on separate levels in building. Cold water. 50,000rp. Centrally located downtown. 2-storey place with choice of cold water / fan (100,000rp per night), or hot water/ AC rooms (150,000rp per night). The top room has a nice relaxing area. Located on the main beach. Good quality rooms and medium price range. Cold water / fan rooms (250,000rp per night) or hot water / AC (350,000rp per night). Located behind the wartel downtown close to the beach. Budget rooms with cold water. 60,000rp. Located 300 meters back from the beach on Jl. Silayukti. Budget place with clean rooms, cold water / fan.